ITB Berlin, which marked its 50th anniversary, clocked record attendance by some 120,000 trade visitors over five days and underlined its importance as the leading trade show for the global travel industry by providing a reliable indicator of the state of the industry, an indispensable networking platform and invaluable impetus for one of the world’s more important industries. Summing up the five-day trade show on the Berlin Exhibition Grounds: the international travel industry has shown its resilience in the face of the refugee crisis and geopolitical risks, demonstrating that it remains in a robust state as a vigorously expanding industry despite difficult global conditions. In Germany, one of the most important source markets for international tourism, the uncertainty of the first weeks of the year is clearly being replaced by a growing confidence. After a somewhat restrained start to the 2016 travel season, the desire among the German public for vacation trips is currently being accompanied by an ongoing positive mood among consumers and a stable job market. Moreover, a reduction in the cost of living and above all the sharp fall in energy prices have given consumers in the Eurozone additional financial scope for the most enjoyable weeks of the year. 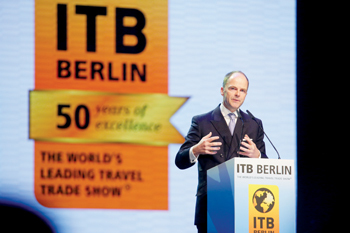 In its 50th year ITB Berlin was stronger than ever. From March 9 to 13 some 10,000 exhibiting companies from 187 countries and regions met with 120,000 trade visitors in the 26 exhibition halls, which had been booked up months in advance. These were the estimated figures given by Messe Berlin, at the close of ITB Berlin 2016. They reveal that the world’s leading trade show for the international travel industry attracted the largest number of trade visitors since it was launched in 1966. On the purchasing side there was also a further increase in the number of decision-makers: two thirds of the trade visitors stated that they held direct authority for all purchasing decisions. Business conducted during the trade show rose from last year’s figure of €6.7 billion ($7.57 billion) to around €7 billion ($7.90 billion) this year. ITB Berlin has again provided evidence that this trade show, a global market place and a platform for personal encounters, provides a 'firm foundation for the industry during turbulent times', and in the digital age too it has lost none of its importance for the travel industry all over the world. Dr Göke says: 'Currently ITB Berlin is not only one of the most important trade shows taking place in Berlin but, over the past five decades it has been a significant economic factor for our city. This international show for the global travel industry has also been a remarkable success story for the trade fair sector in Germany, and this is something of which our company and the Berliners too can be very proud. ITB Berlin is 'more than just a trade show' – today, all over the world, it represents Germany, symbolising hospitality and serving as a practical example of international understanding. The travel trade show that was held for the first time in Berlin 50 years ago has now evolved into a real international success: ITB Asia has been held annually in Singapore since 2008. Furthermore, as Messe Berlin has recently announced, from May 2017, ITB China will be taking place annually in the populous city of Shanghai in cooperation with that country’s major tour operators and travel agents. The world’s largest convention for the global travel industry attracted a record attendance. The 200 events at the ITB Convention were attended by over 26,000 visitors. It was taking place for the 13th time and occupied eight halls on the Exhibition Grounds. The main themes at the ITB Convention, which is regarded as the 'think tank' for the international industry, were 'Travel 4.0' and the complete digitalisation of all the various business processes of travel companies. Due to the evident willingness of many travelers to spend, the subject of luxury travel also attracted a great deal of interest. Discussions also took place about the opportunities and risks facing tourism as a consequence of the influx of refugees to Europe. With the first appearance in Europe by a humanoid robot from Japan – clad as an elegant trade show hostess – visitors to ITB Berlin were able to see for themselves how engineers and scientists view the future of a service-based industry. The importance of ITB Berlin as an economic and social platform was underlined by the presence of many prominent speakers. Among those providing information and inspiration for the participants in the Convention were Günther H. Oettinger, EU Commissioner for the Digital Economy and Society, Dr Gerd Müller, Federal Minister for Economic Cooperation and Development, and Professor Dr Hans-Werner Sinn, President of the ifo Institute – Leibniz-Institute for Economic Research. According to a provisional estimate by the organisers, some 60,000 members of the public took advantage of the wide range of information available from tour operators, including those representing niche markets. As in previous years, during the weekend, visitors were able to make travel bookings at ITB Berlin. 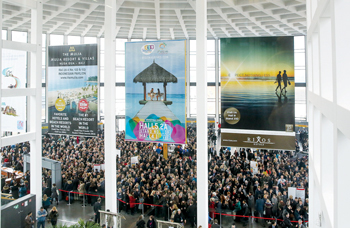 Between March 9 and 13, ITB Berlin attracted some 180,000 visitors. Haris Mohammed, acting managing director, Maldives Marketing and Public Relations Corporation, says: 'On behalf of the Maldives and our entire tourism industry, I would like to thank you and congratulate you for a wonderful ITB Berlin 2016. We are very pleased that we were the partner country of ITB Berlin 2016 that marked the 50th anniversary of ITB Berlin as well as the Visit Maldives Year 2016, in which we celebrate the tourism industry in our beautiful country. More than 5,000 accredited journalists from 80 countries, as well as around 380 bloggers from 30 countries, reported from ITB Berlin. In addition to 124 delegations, it was attended by the members of four royal houses, 48 ministers and 87 ambassadors from all over the world. The next ITB Berlin will take place from March 8 to 12, 2017. The Official Partner Country will be Botswana.